The wait is over. As of now Amazon Kindle 3 WiFi is back in stock on Amazon.com – no more backorders. You can order yours today and receive it within a day or in about 5 days depending on shipping method and where you are located. 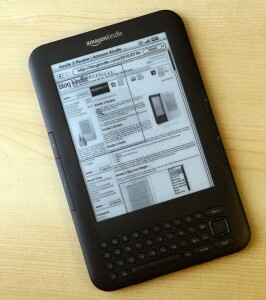 Kindle 3 3G+WiFi seems to be more popular and it still remains sold out. Estimated ship date for current orders is September 22nd (1 week delay). The wait time has considerably shortened compared to several weeks when the device was originally released. Kindle DX (either 2nd generation white or Graphite with a newer screen) are also in stock and available for immediate shipping. Relatively low demand for Kindle DX is explainable: with Kindle 3 WiFi out it’s inevitable that at some point Kindle DX WiFi will follow (perhaps with a price reduction to boot). Public (me included) are waiting for this moment. As far as reviews go, Kindle 3 has accumulated 883 reviews so far. 58% of reviewers give it best possible five out of five stars, 18% gave it solid four stars, 7% gave it average three stars, 5% – poor two stars and 12% – slammed it with a one star review. This entry was posted in Amazon, Kindle 3 and tagged Stock by Dzmitry. Bookmark the permalink. I’ve had an order for a White 3G in since Sept. 2, and recently found that it was supposed to be shipped Sept. 20, with one-day shipping. However, as of this morning all Kindle models are now shown as in-stock, and available for Friday Sept. 18 delivery if you order in the next seven hours. Since it showed as being prepared for shipment, and not cancelable, I contacted Customer Service, who was able to cancel the order, so I could re-order for delivery sooner. I entered a new order a couple of minutes ago, and Amazon now shows a delivery estimate of tomorrow – Sept. 17. Amazon sure seems to be having ongoing problems telling a straight story on shipping dates with the Kindle.